What’s in a name? Everything you ever wanted to know about the Holy Spirit is contained in this exciting and comprehensive book! The names of God represent a deliberate invitation to you to take advantage of what God can and wants to be in your life. Whatever you call Him is what He will become to you. Do you know all of His names? How much deeper would you like to know the Comforter? You will learn the following – and much more! Each chapter concludes with points to ponder designed to stimulate and inspire you to reach a higher level of spiritual knowledge and living. 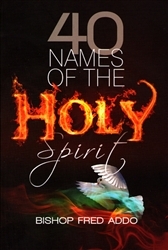 The Holy Spirit is your strengthener – learn how to enlist His personal help today! Chapter 1: What’s in a Name? Dr. Fred Addo has preached to countless people in evangelistic crusades, leadership seminars, churches, and schools worldwide, with signs and wonders following. Bishop Addo pastors the International Praise Cathedral in Kaduna, Nigeria. His wife, Dr. Funbi Addo, is also a preacher. Recently, the Lord led Bishop and Mrs. Addo out of pastoral ministry and into the mission field.